This past weekend was great… no big plans, no place to be. We pretty much just did a bunch of hanging out and that was OK by me. Friday evening we made a pizza and opened a bottle of wine, and we had dinner on the back porch because the weather was something out of a magazine. Sunshine, seventies, and deep blue skies with big, white, fluffy clouds rolling by. We put Ed Sheeran’s latest album on to set the vibe and we turned on the twinkle lights to provide a pretty back drop and we then proceeded to sit for nearly three hours just enjoying each other. The kiddos played and B and I chatted and sipped our wine. We let the kiddos have treats out of their Easter candy and I joined them by having a lollipop, to which B swears he’s never seen me eat. I’m the candy queen… I don’t discriminate! Gimme all the lollipops! We had also just had the lawn aerated a couple of days prior so Jacob had a blast picking up all of the dirt clumps and crumbling them. We stayed out back until dark and then we put the kiddos down for bed so we could catch up on a few shows with big bowls of frozen yogurt in hand. A good evening it was indeed. Saturday we stayed home all morning and most of the afternoon catching up on a couple of projects around the house. The kids have had some floating shelves in their bathroom for a couple of years and one of them was starting to sag, so B added brackets underneath each of them for more support. They don’t look near as elegant as they used to, but I figure hey, it’s a bathroom. Does it really matter all that much? Saturday evening we decided to forgo church because we had a guest priest saying mass and the kids had been pretty crazy/fussy all day so we didn’t want to risk the meltdowns. Instead, we finally took Jacob to get his hair cut (it was long overdue) and Olivia and I amused ourselves by making silly faces while we waited. We then went to an early dinner with my parents and my uncle. Olivia had been begging for cheese dip, so we had Mexican, of course! Momma’s not going to turn down a margarita! After dinner the kids started begging for DQ Blizzards (I swear, they’re conditioned to ask for them every single time after we have Mexican!) and we obliged since they had been behaving so well since we had left the house. DQ failed to give us lids and they had piled the ice cream so high that it didn’t all fit in the cup, so by the time we got home with them they looked like this. Sunday morning I unthawed some strawberries that we had picked up from our trip to the strawberry patch and I finally made a strawberry pie to take to Sunday dinner at my parents’ house! It turned out well and I will be sharing the recipe with you tomorrow. Sunday was rainy all day so we sat the ferns out in the front yard to get some rain and I couldn’t resist taking this picture. Because it’s true! Why oh why don’t I have a green thumb? We spent the afternoon having lunch at Jason’s Deli, scoping out the sale at HH Gregg since they’re going out of business, and then taking the kiddos to Barnes and Noble to play for a bit. We were hoping to make it to a playground but the rain was pretty constant, so instead we headed home for naps and laziness. The rain brought in a cool front, so I got all cozy in some fleece PJ pants, turned on some jazz, and worked in my office for a bit while Olivia napped. It was one of those deliciously delightful rainy days… not one of the yucky ones! We had spaghetti and vino at my parents’ house for dinner, and then we brought out the strawberry pie which was a hit! All in all this weekend was just lovely. I couldn’t have asked for a better one. The down time came at just the right time as it was much needed. Now to get through this work week… I don’t think I’ve worked a five day work week in several weeks! EEK! Happy Monday! Sounds like a fantastic weekend! Those weekends are the best when you don't have to rush to be at the next place!! Hope you have a great day! It's still raining here! Your porch is the best! We ate outside Thursday night because the weather was amazing. And weekends without plans sometimes turn out to be the best ones! I am in love with your pretty floral tank-I want it! Your little man's haircut is so adorable, they always look so different after! And I am jealous every time I see your back porch-one of our big summer projects is at least getting some pavers in our back yard so we can start to eat/hang out back there, I can't wait! Have a great week, girl! I love your back porch. Perfect for being outside. I have been reading Two by Two, but when I got to the part where the little girl falls on her bike I was predicting such bad reactions from his soon to be ex wife that I put it down. It hurt my heart just thinking about it. I'm guessing I should keep going? Sounds like the perfect weekend, seriously! And your back porch has me swooning, I wish I lived close so we can hang out back there ha ha. And I love Jacobs haircut! I love how relaxing your Friday night was! Vino, music, sitting, chatting with the hubs and watching the kids play...perfection. In fact I read that part of your blog post to Jon. I feel like we're always moving on the weekends, particularly during the summer. We've vowed to each other to sit down this summer and just relax! We need to be more like you guys! Which also means I need some twinkle lights!!! Seriously, you watch! I'm going to get some! Loooove those fabulous rainy spring days! I'm happy you were able to enjoy the rain and get some things done. Have a great Monday, lady! Our weather was top notch this weekend and this week looks to be more of it. YAY! for good weather! Yes ma'am! You gotta love it! Sounds like the perfect relaxing weekend! Love that Olivia wanted cheese dip - a girl after my own heart! Happy Monday! What a fun and relaxing weekend you all had! I love the hair cut! I love your lights on you back patio. We have some, but I am wondering where and how to hang them. Hope your week is off to a great start. Happy Monday! Yes, hanging them was a bit of a pain, but B was able to get them all up there and I love them so much!! Happy Monday! LOL at the sign by the plant! Story of our lives too. We decided to stop spending money on plants all together so now the only ones we have are the ones my mom gave us after she read my confession about how all our plants died haha. Haha. Yeah, I might need to start investing in some good fake ones! You finally finished the book?!? Props to you - haha. Aren't free, lazy weekends the best?! Sounds like a fun weekend, low key is great! Love weekends like these. So low key but good too. I think ferns are the only plant that I have any luck keeping alive... but really. I usually soak them every couple of days for 30 minutes or so. I haven't killed one yet! Happy Monday friend. Sounds like you had a wonderful time with the family! I need to check out Ed Sheeran's new album - I'm starting to become a fan! Oh girl, it is SO flipping good! We're going to see him in the fall and I cannot wait! I'm obsessed with him! I love ferns...they remind me of my Meme as I can remember her taking them all out once a year and replanting...I don't have to do that since mine usually only last about 6 weeks LOL. I may read that book next and I'm so glad you reminded me about Lauren Grahams book! I finished Behind Closed Doors this weekend and that's the first time I've read a book that fast since Christmas holidays. Happy Monday! Hope you have a super week! That dinner on the back porch sounds so nice. I want one at our next home (we currently have an apartment because husband was promoted and needed to start his new job quickly; we couldn't be too picky). I like that floral top in the last picture, pretty! Low key weekends are the best kind. Love love your back porch, wish I had one. 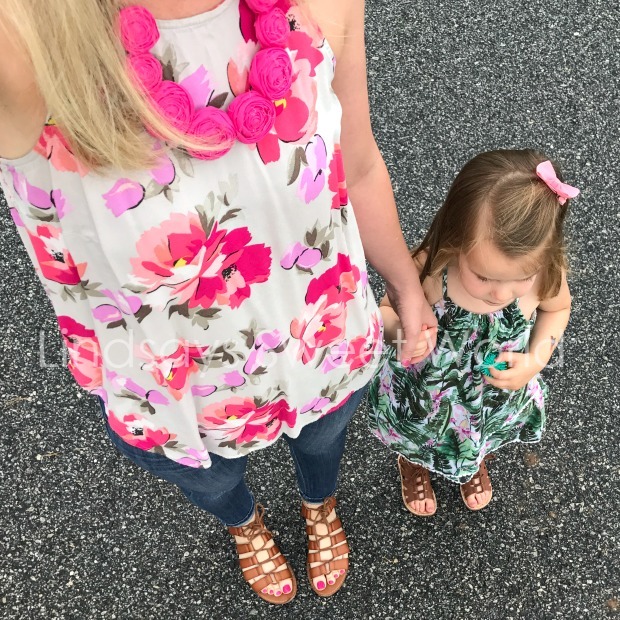 I love love that floral top of yours, perfect for spring. Love dinner on the back porch and the laid back weekends! Isn't that funny how the kids want DQ blizzards after Mexican, they must want to start a little tradition mama. Hope you have a wonderful week ahead beautiful girl! Haha. Yes they must be! They take after their momma... what can I say? Ah, what a perfect weekend! The slow ones are the best kind, aren't they?! 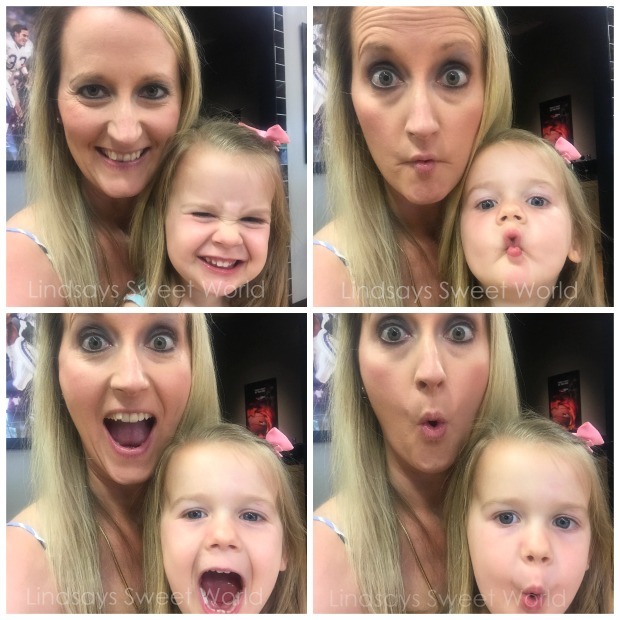 We love us some DQ too! And, I was feeling you on the margarita. So nice. Love Jacob's hair cut and LOVE Olivia's maxi dress. You guys are so cute! Love your twinkle lights- I've been wanting to add some to our back porch. I live for DQ M&M blizzards with the chocolate syrup- yum! Sounds like the perfect weekend! Dinners on the porch are my absolute favorite. Mine too! You just can't beat spring and fall weather! Testing....You may need to help me tomorrow! What a perfect weekend! Your backyard oasis is so dreamy. I’m fairly certain I would want to spend all of my time there. That Lauren Graham book is next on my list. Let me know how you like it! Sounds like a great weekend. My kind of weekend. You have the best backyard. Love all the beauty of it! What a nice and chill weekend. I love it when we can just spend time in our own backyard. I once read everything Nicholas Sparks published, but not in a long time. I'm guessing maybe it wasn't the best if you've been reading it since Christmas? Thanks for linking, Lindsay! Well, we have also been really busy, so it's not a true indicator of the book necessarily. I'm glad I read it, but it definitely wasn't my favorite of his!